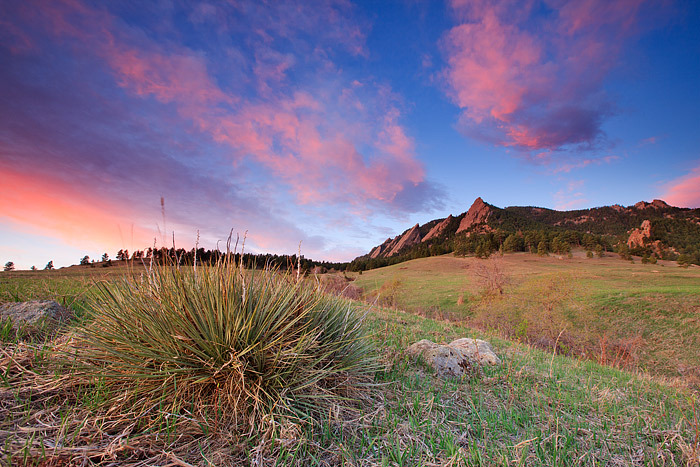 One of the best sunrises I have witnessed from Chautauqua Park in Boulder unfolds over Boulder's iconic Flatiron formation. Spring is unfolding in Chautauqua Meadow as the grasses come to life after a long winter with a vibrant green hue. The clouds towering over the Flatirons this morning turned a magnificent pink right as the sun broke the horizon to the east of Boulder. Photo © copyright by Thomas Mangan.